New England SpinTech is committed to providing the highest quality products and services to our diversified customer base. As one of our valued customers you can be assured that quality is a top priority. ISO 9001:2015 is a global standard which ensures quality steps are in place throughout the entire company. We have developed in-process auditing, process performance metrics, and operate under the fundamentals of continual process improvement. ISO 9001:2015 certification demonstrates our commitment to constantly improve the integrity of all we offer. Implemented processes are compatible with documented procedures, and considered effective. Personnel are properly trained on the processes and procedures. The Quality Management System is effective, implemented, and meets the requirements of the ISO 9001:2015 standard. 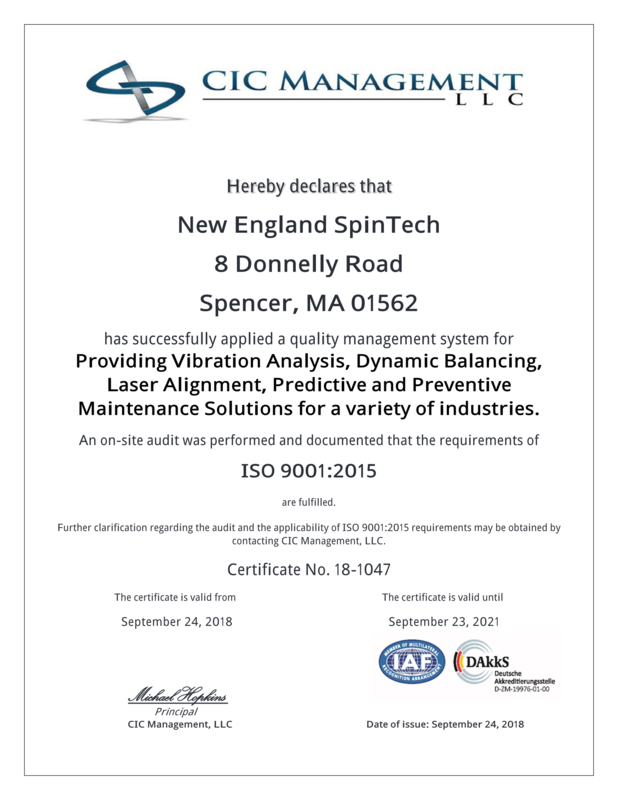 Achieving this certification clearly demonstrates New England SpinTech’s commitment to supporting our partners with quality products and services. This commitment starts with our senior management and is fully supported by all personnel. New England SpinTech is the leading provider of Vibration Analysis and other reliability services in New England. Our vibration engineers and technicians are certified by the Vibration Institute to ISO standard 18436 which specifies requirements for the training, relevant experience, and examination of personnel performing condition monitoring and diagnostics of machines using vibration analysis. They are also trained and experienced with Laser Alignment and Dynamic Balancing procedures to correct any issues we find. Each New England SpinTech Team Member will ensure that the quality of the company’s products and services satisfies our customers and any applicable requirements. We continually improve while maintaining the effectiveness of our Quality Management System (QMS) by periodically measuring our performance against our objectives.